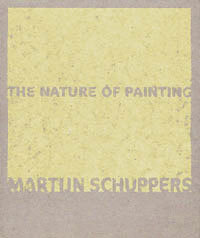 From: ‘The Nature of Painting’, Stedelijk Museum Schiedam/VOUS ETES ICI, Amsterdam. 3rd April - Even though I use the medium of photography for these works, and the result is of course a photo, I think like a painter when I am taking the photograph. Not so much in terms of a painterly image as in terms of an image of painting. They are photos about the medium of painting. They literally signify zooming in ever closer on actual painting (so as to tear it apart, divide it up again, chop it into pieces, fragment it and analyse it), to thereby end up in another ‘world’, and generate images. It is the examining eye that represents this work. These images take me further, if not forwards, but in an almost scientific way, both in terms of image and the way I think about it (or have to think about it). Back to the right direction between nature and culture, I would now like to give the Drip ‘n Drop photo’s as well as ZOOMINSIDEOUT, the working title of ‘The Nature of Painting’. It creates a sort of distance, as if it were beyond the capacity of my will (as a phenomenon that I have observed), I cannot distance myself from it, whereas I nevertheless involuntarily do so. It is painting that sweeps me along into it. On the other hand this title takes the approach of the images themselves± scientific photos that show the paint as cells, organic entities, a life into wich is zoomed, where highly advanced techniques are needed to show this hidden life. Even though they are photos, a medium that naturally distances itself from the subject, unlike painting (which Robert Ryman Called a ‘hands-on-thing’), there are of course the painterly acts I carry out first. A quasi-action, drips that are a quotation, an appropriation, without cynicism… These works are both a hands-on thing and a hands-off thing. 10th April - Quite apart from the technique, I am so aware that this is painting. 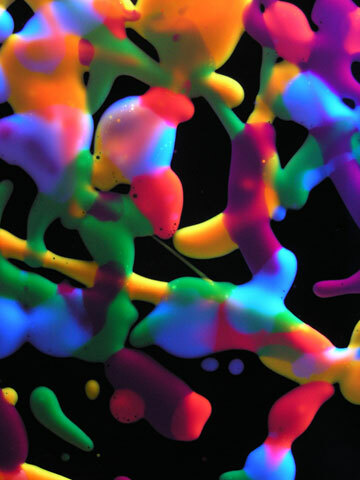 In the last photographs just about every pixel is a fluorescent pigment. One to one, you might say, regarding the transfer of paint to digital material. You can see this in the places where the paint is thinnest. The transformation of paint to image once again goes via very short route, but in literally enormous steps. 12th April - The word ‘enlargement’ embraces exactly what I do, and in a figurative sense I stretch painting. Take it out of its context, meaning take radical painting out of its context as a result of depicting ‘itself’, and thereby assuming a figurative appearance. 14th April - Zombie Painting. Bring dead matter to life; that’s what it seems like when I look at the photo that has ‘produced a sort of human paint embryo that hangs like a pupa from the branches’. The paint cells seem to float around in dark but clear water and have an almost tropical beauty. 18th May - I run up against it every time: the discrepancy in works where technique is an almost independent element. I cannot separate the two components. On the one hand the motivation to get to work, and on the other hand the technique to arrive at an image. In my work they are inseparable. The technique makes an image, and even if in my work you no longer see how, that is of the great importance. That is where my paintings link up with photography and digital media. The illegibility of the work resulting from something that is constructed in such a way gives the image its meaning. That is why there is friction between the existing images stored in our collective memory, and also between painting and photography. And it is precisely because of its photographic exterior that it finds easier to fit itself into that other visual world than that of the material painting.